It ended on time, even a few minutes early. Though it got a little annoying towards the end with every presenter reminding people the show was running late and that their jokes were cut. Worse? The jokes that stayed weren’t that good. Watching Ricky Gervais blow a few minutes on a good bit was well worth it though. Just what were the hosts there for? They didn’t even open the show (thanks Oprah!) and they only appeared once or twice the rest of the night. If this show is going to have hosts then they need to do something. It should be their job to move the show long. Otherwise, skip the whole job altogether. Other than an excellent Cartman impression the only thing Josh Groban did tonight was prove his voice only works with one style of music. My picks were pretty off for the better part of the night. Bad for me but great for some folks who surprised the oddsmakers and took home the awards. I definitely tip my hat to Bryan Cranston who foiled Emmy pools nationwide for his best actor in a drama series win over “sure thing” Jon Hamm. Here’s the thing…I called Bryan Cranston’s win not once but twice right here on this blog. I really should’ve double checked this thing before submitting my list. How much do I love that Tina Fey took home the biggies tonight? Almost too much. She’s truly remarkable. I still don’t quite get why folks aren’t watching 30 Rock. 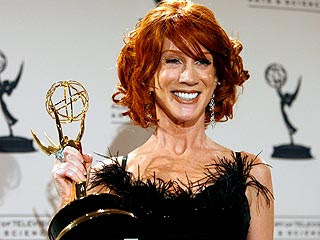 Other than Tina Fey, the biggest winner of the night? Don Rickles. Funniest guy on stage. We need to welcome Old Hollywood back for these things every year. The Laugh-In folks can stay at home though. Laugh-In is usually much funnier, too bad that’s the impression most young people will be left with after tonight. Check some of it out at your local media library folks. It was great 40 years ago. And briefly: Best Dressed: Julia Louis-Dreyfus, Worst Dressed: January Jones…Yikes! Want a list of all the winners? Check ’em out here. I’m already chomping at the bit for next year. I suppose the Golden Globes will have to tide me over. So it’s no secret that I’m a little into Mad Men. This weekend that love hit a new level of potential fanaticism. Anyway, I downloaded the MP3 and went over to Mobile17. If you’re not familiar with the site, you can take any MP3 on your computer and make a ringtone 4-40 seconds long…for FREE! Go now. So anyway, I made myself a Mad Men theme song ringtone and now whenever my phone rings I wait a little bit to answer. Sorry if I missed your call today. My second fanatical moment? I heard Jon Hamm will be hosting SNL in October and I screamed at the top of my lungs. Smoking and slick period costumes combined with Kristen Wiig and other funny folks? Swell news indeed. Third, I am re-arranging my schedule tomorrow to ensure I can watch the Emmy’s live tomorrow evening just so I can see the show continue to make history. I may Live Blog, we’ll see if I’ve got the energy. However, for sure I’ll post my Emmy picks tomorrow morning. 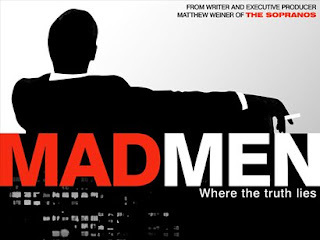 Expect a lot of 30 Rock and of course…Mad Men. 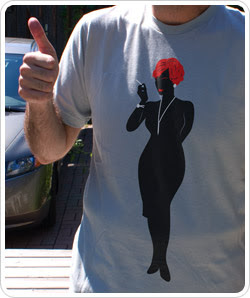 Glarkware is selling this shirt dubbed “Office Manager.” The silhouette bears a striking resemblance to Joan Holloway, Sterling-Cooper’s curviest admin. Anyone secretly hoping the Mad Men cast wears period costumes to the Emmys? Cloris Leachman Is F’n Brilliant! I don’t watch Dancing With The Stars but I do like to see which “celebs” they can wrangle to participate. 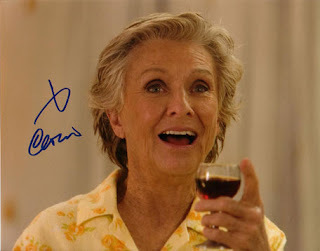 The list has improved each go round and this season’s crop of stars includes some pretty notable names (Beijing Gold Medalist Misty May-Treanor and gastrosexual Rocco DiSpirito to name a few) but none of them are as legit famous/talented as Cloris Leachman. She’s an Oscar winner, and an Emmy winner a million times over. Plus she’s tough as nails, even at 82-years-old. And did I mention she’s flippin’ hilarious! Here’s the video (Sorry it’s not embedded. I’m working on it. ) of Leachman sticking it to Bob Saget and the rest of the panel at Saget’s Comedy Central Roast. When I saw this on TV I went into one of those ” I’m pretty sure I can’t breathe yet I can’t stop laughing” kind of moments. She may be worth watching Dancing for. Want more? Here’s Part 2.